School security is a hot topic for school leaders, but are CCTV cameras keeping students and teachers safe or raising pupils in a climate of fear? The UK has witnessed a massive expansion in surveillance technology in recent years. With security coming high on the agenda at local, national and business level, the use of surveillance technology has exploded, and schools have been quick to follow the trend for ever more advanced security systems. Facial recognition systems, metal detectors, electronic identity cards, perimeter fences, controlled access gates, retinal scanners and fingerprinting technology are now all utilised in educational environments, whilst CCTV cameras are commonplace in schools of all sizes. Research shows that at least 85% of teachers have CCTV in their schools, and this figure is on the increase. A survey carried out by the ATL (Association of Teachers and Lecturers) showed that 98% of these schools use the cameras purely for security purposes, but more than half the teachers surveyed reported that surveillance was also present within the school building, and the introduction of CCTV cameras in classrooms and corridors has massively increased the number of cameras installed within individual schools in recent years. Stockwell Park High School in South London, for instance, now has 100 cameras on the school site– two in each of its classrooms and 40 in its canteen, corridors and playgrounds – whilst Ely College in Cambridgeshire, has a total of 114 cameras installed, that’s one camera for every 10 pupils! CCTV cameras are installed in schools to combat the threats of intruders, bullying, violence from pupils and parents, vandalism, graffiti and arson, and to monitor the behaviour of pupils in certain, less supervised parts of the school. Undoubtedly, they do provide significant benefits to schools, reducing parents’ fear of crime, deterring intruders, preventing misbehaviour and unauthorised absences and providing evidence for the police in serious incidents. Moreover, surveillance has become so commonplace in today’s society that many school leaders believe there to be a public expectation that CCTV will be part of the furniture of any educational establishment. But whilst the advantages of security cameras may be clear to see, many people are uneasy about the large number of cameras now employed in schools, especially where they are being introduced into classrooms and other sensitive spaces such as toilets and changing rooms. A report by the Information Commissioners Office (ICO) last year found that video surveillance is increasingly being used by schools to keep check on pupil behaviour, particularly in “private” spaces, a fact which led to wide-ranging concerns. 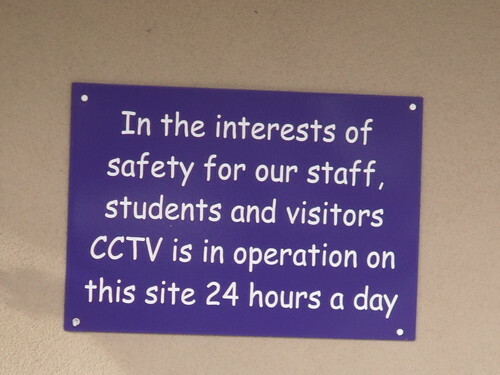 School leaders do have a responsibility to ensure, as far as reasonably practicable, the safety of the staff and pupils on the school site, but whilst CCTV may be one way in which they can do this, there is a raft of legislation that they must comply with when installing cameras in schools. The Data Protection Act 1998, the Regulation of Investigatory Powers Act 2000, and the CCTV Code of Practice issued by the Information Commissioner all govern the way CCTV systems should be used. But despite clear guidance being laid down regarding the use of surveillance technology in private or sensitive areas, many schools are still failing to satisfy parents and staff on data protection and covert surveillance issues. The report by the ICO states that the number of complaints received has increased in recent years, as more and more cameras are being installed within school buildings and school teachers have found that CCTV has been used to monitor their teaching performance. The use of CCTV in classrooms, whilst becoming increasingly prevalent, is still highly controversial. Not only are they extremely unpopular amongst teaching staff, but union officials have repeatedly voiced their concerns on the grounds that the surveillance could lead to the excessive monitoring of teaching staff, allowing schools to flout official guidance on lesson observations. The ATL’s policy on CCTV in schools does not support the use of cameras in classrooms stating: “ATL is yet to be convinced in general of the educational merit that surveillance cameras can allegedly bring to the classroom,” and Article 29 from the European Union’s Data Protection Working Party also strikes a cautious note on the use of CCTV in schools, particularly in classrooms. The document concedes the benefits of CCTV in entrance ways and certain other parts of the school where a number of people circulate but concludes that: “…in most other parts of the school, the pupils’ right to privacy (as well as that of teachers and other school workers,) and the essential freedom of teaching, weigh against the need for permanent CCTV surveillance. Considering this clear guidance, it’s perhaps understandable that numerous individuals and human rights organisations feel concerned about some schools’ apparent disregard for its advice, and uneasy about the fact that alongside CCTV cameras, 3 in 10 secondary schools now use biometric data to identify pupils, enable them to pay for lunch or to record attendance. It’s also understandable that measures are currently being put in place to regulate this new technology and enable schools to use it in a way that is appropriate and safe. Earlier this month, for instance, ministers announced that schools were to be banned from using fingerprint and facial recognition technology without expressed consent. The announcement means that parents now have the right to veto a school’s request for biometric data and that, from September next year, pupils who refuse to participate in fingerprinting and facial scanning schemes must be provided with alternative ways to access school services. Schools Minister Nick Gibb said: “biometrics in schools is a sensitive issue. We want schools to be in no doubt of their responsibilities when it comes to young people’s personal data.